I started this exploration by collecting my data. 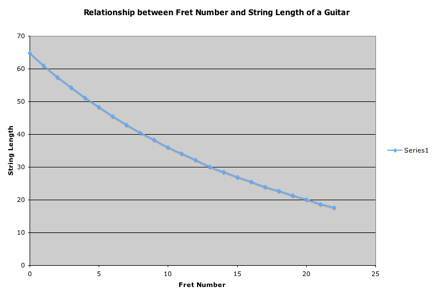 I measured the length of a guitar string from a fret to the bridge of the guitar. The length of the open string was my initial measurement and the following frets, I numbered from 1 to 22. Below is the data that I found. 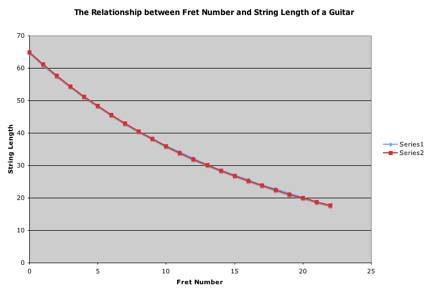 The left column is the fret number and the right column is the distance from that fret to the bridge of the guitar. 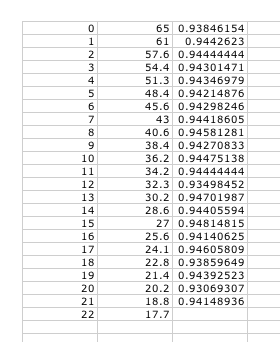 I then graphed the data in a scatter plot, using the left column as my x-values and the right column as my y-values. Below is the scatter plot. Next I found the mean of the ratios, which was approximately . Then I computed a third set of data by using the equation . 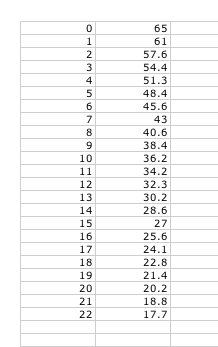 Below is the new spreadsheet and the new chart. Calculate a measure of the error between your model and the collected data by taking the square of the difference for each time, sum the squares, and divide by the number of data points. 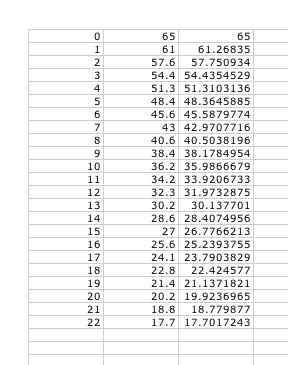 Below is the spreadsheet, where I have calculated the measure of error, using the above method. The first column corresponds to the fret number, the second column corresponds to the measured length, the third column corresponds to the calculated length using the formula, the fourth column is the difference between the entries in the second and third columns and the fifth column is the squares of the entries in the fourth column. The last entry in the fifth column, 0.04306591, is the average of the other entries in the fifth column. It is the measure of error. So my measured values are only 4.31% off.